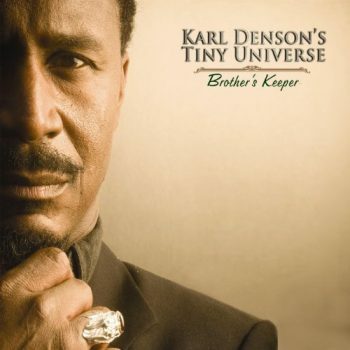 I was a little depressed after listening Brother’s Keeper, the latest CD by Karl Denson’s Tiny Universe. That’s probably not what Brother Denson wants to see as the first line in a music review about his album. He’ll be relieved to learn that my blue state of mind has nothing to do with the quality of the music on Brother’s Keeper. This 11 track record is excellent. It is one of the best records – beginning to end – that I’ve heard all year. In a way, it can be said that Denson’s music was the source of my depression. I’m listening to this CD, and thinking that the world needs to hear this mixture of southern soul, funk and modern R&B. However, I’m not sure that Brother’s Keeper will have the kind of saturation that some major label release that is not nearly as good will have. Eventually, I have to come to the realization that I have to check myself about taking this so personally. This, after all, is just one man’s opinion and I’m not even a musician. And I admit that I was inclined to like Brother’s Keeper because I’m a funk and soul guy. The band would have had to mess really bad for me to hit fast forward. But it was clear after the first two tunes – the jumping Southern soul joint “Shake it Out” and the ultra funky bit of Cali jam “Where It Counts” – that Karl Denson’s Tiny Universe knew what they were doing. The band jammed its collective foot on the gas and never really let up. “Drums of War” is a funky anthem that laments the fact that our world is rife with religious intolerance. “Mighty Rebel” stays in the spiritual realm with the band using a reggae beat on a song that reminds listeners that Jesus was and is the ultimate rebel.